So here we are, I finally took the time to write this one up. I’ve seen this translated as Portuguese Green Soup although it actually should be Green Broth, but I find that the name in English is a bit disgusting, so I’ll refer to the original name, Caldo Verde. 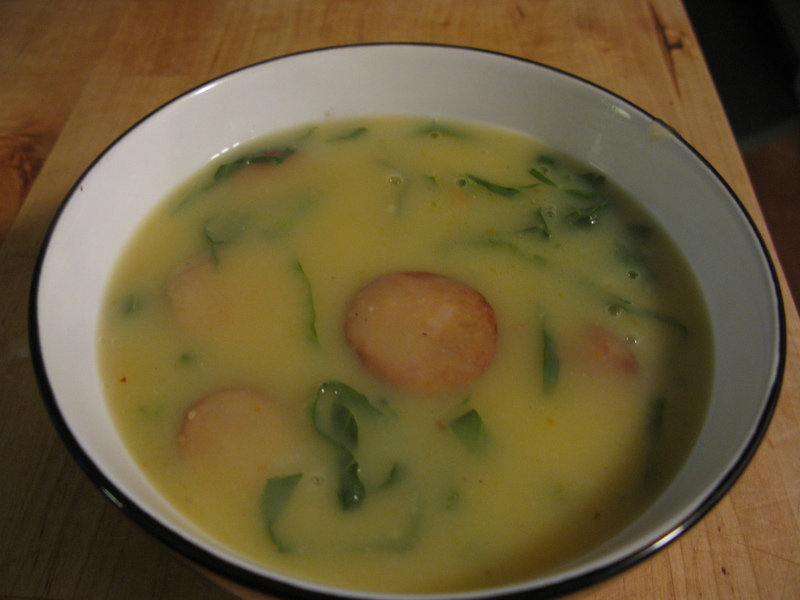 I have found some recipes in english for this soup (most notably from chef Emeril, whose mother was Portuguese), but for one reason or another, it never looks to me like the real thing (at least the real thing I used to have in Portugal). So, I’m here to try to set the record straight and to figure out a way to get it close to the taste I miss. This is actually a very simple recipe, but because we have to find replacements for some of the hard to find ingredients, people end up with very different results. My quest here is to find a way to get the closest result to the original, with ingredients I can find in American supermarkets. So, first I will explain the original recipe, and then I will discuss the alternatives for the ingredients. In a big pan, put the olive oil, garlic and onion. Let it cook until onion is translucent, but not browned. Add potatoes and water, season with salt, and bring to a boil. Let cook on medium heat for about 20 min, or until potatoes are cooked. Remove from heat and puree. Traditionally, we use a hand blender, but if you don’t have one, you can use a traditional blender and do it in batches. When the liquid is all smooth (this is why we call it a broth), bring back to a boil, add the collard greens and the chouriço and let cook for another 7-10 minutes. Adjust the seasoning at this stage too. When everything has been cooked add 2 tbsp of olive oil and mix well. Olive oil – You want to use very good quality extra virgin olive oil for this. This is cheap and common in Portugal, not so much in the US. The rest of the ingredients are really not that expensive, so investing in the good olive oil for this is really worth it. Potatoes – The base of this soup is really all about the potatoes, so you can play around with it, but go with something not too starchy and flavorful. For this first run, I used yukon gold potatoes. I also added one carrot to balance out the power of the chorizo I got (I’ll explain in a bit), but after trying it, I advise against it. Potatoes only is the best way to go. Chouriço – This is the most challenging ingredient to find in the US. No matter what you do, you won’t find exactly the kind of chouriço used in Portugal, but there are some good approximations. The reason you can’t find the good chouriço in the US is because the best chouriços are the ones that are made in the countless little villages, where families get together to slaughter a pig and make the chouriço the traditional way (we used to get homemade chouriços from my godmother and I’ve never tasted anything like it). My parents still buy these homemade versions, but smoked meats are not allowed as imports to the US, so I can’t bring them. Ok then, if you happen to live close to a Portuguese community (the big ones are in Boston, Newark, Rhode Island and San Francisco), you can find the Portuguese supermarket for the best substitution, which is the Portuguese chouriço made in the US (you might even find some online grocery sites that will ship it to you). Second to that, I would recommend Brazilian linguiça. If you can’t find either of those, then try spanish chorizo. The main difference between the Portuguese and Spanish types is that the first one is marinated in wine and has less paprika. So, Spanish chorizo often ends up being much spicier than the Portuguese chouriço (I’m generalizing here, it’s really not that simple). But you might actually enjoy that, so give it a try. Whatever you do, don’t buy any kind of sausage that has not been smoked (it will just crumble in the soup and not be cooked properly). If you really can’t find anything at all, I would try to get smoked bacon, bake it until it’s crispy (don’t fry it, or you’ll end up with too much fat) and add it only at the end for some crunch. I haven’t tried it, but my guess is that it would be an okay substitution. Here’s a picture of what I made last time, with Spanish chorizo I found at Whole Foods. It was good, but I think the spiciness was a bit overpowering. What can I say, I like the traditional version of it. This is perfect for a late night snack, to eat when it’s cold outside and it’s also supposed to be a pretty good hangover cure. Hope you try this soon and let me know how it turned out! This entry was posted in Portuguese recipes by Ines. Bookmark the permalink. nham nham… You should also try Sopa de Grão com Espinafres… That’s easy!